Asia, the world’s most dynamic economic region, is facing heightened security-related tensions. China is expressing increasing confidence in its territorial disputes and is gradually expanding its influence in the South and East China Sea. Japan is attempting to free itself from the confines of its former security policy and significantly expand the scope and geographic reach of its armed forces. Throughout Asia, nations that can afford to do so are investing heavily in their military capabilities. Over the last decade, China has tripled its military spending; Indonesia has doubled its defense budget; and India has become the world’s largest importer of arms. In short, the threat of an arms race looms large over the region. The situation is sustained by the financial capabilities the region amassed through years of continued economic growth. The risk of military conflict in Asia is rising, whether unintended or because a government in the region believes a particular red line has been crossed. The sheer size of the Asian economies and the potential disruption to vital trade routes and supply chains means that a war in Asia would be devastating for the global economy. Although Europe would be severely affected by conflict in the region, neither the EU nor individual European countries currently play a relevant role in Asian security policy. Apparently, the skirmishes taking place over Far Eastern rocks and reefs are too distant to be of any particular bearing. Instead, the EU remains focused on the pressing problems in its immediate neighborhood. Consequently, the current climate might imply that there is no role for Europe in Asian security policy. There is a consensus within the European political class that a European military presence in Asia or intervention in the region’s security policy remains out of the question. This stance is at odds with the fact that Asia has become one of the main markets for the European defense industry: the current trade volume with Asia is worth billions. Given the fact that defense budgets across Europe are declining, many companies view the Asian export market as a chance to maintain their manufacturing capabilities and compensate for shrinking revenues from Europe. European companies – particularly but not only from the “big three” of Germany, France and Britain – supply arms to virtually every Asian country: Indonesia and Singapore buy tanks, Singapore and Korea submarines, and India receives sophisticated fighter aircraft. European arms exports range from individual assault rifles and radar technology to complex weapon systems, self-propelled artillery, and attack helicopters. Even China receives an astonishing amount of dual-use technology from Europe, despite the current arms embargo. European arms sales to Asia thus mean that Europe has been involved in Asia’s on-going “Great Game” for a long time. But Europe remains in denial. Europe’s Asia policy is unfolding without a clear strategic direction. European armaments companies compete with one another for market share on the international stage. The political support they receive merely reflects the economic interests of the countries involved in the deal. This situation is unlikely to change, and transparency is scarce. There is no substantial debate within Germany and between the major European arms exporters on security political interests in Asia and how they could be linked to arms sales to the region. Is it in Europe’s interest to strengthen small Asian countries that are threatened by larger states such as China, with the aim of enhancing regional security? Would it be appropriate for Europe to engage more closely with its ally – the U.S. – and support it in its pivot to Asia? Should only Asian democracies receive support? Or should the discussion be centered around the idea of empowering Europe’s partners in the region to provide for security themselves, a move wholly within the spirit of the “Merkel doctrine”? Clearly, Europe has limited influence. The United States, Russia and China, for example, control a significantly greater market share. Nonetheless, the political relationships that result from the expansion of trade, and the defense policy relations formed through arms deals, could be used to reinforce Europe’s influence in the region. 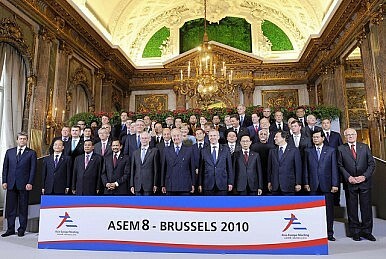 They could support the development of a regional security architecture that might secure long-term stability in Asia. Seen in this context, the current uncoordinated approach to Asian security policy implies that Europe is punching significantly below its weight. Admittedly, most countries find it as difficult to speak openly about the rationale behind their arms sales, as about the work of their intelligence services. The recent debate in the EU about the French sale of two helicopter carriers to Russia provides a case in point. Nevertheless, given the growing risk of war in the Asia-Pacific, it is high time that Germany and Europe strategically tackled the security policy challenges they face in the Far East. Building stronger links between security policy and arms exports would represent a difficult but important step towards developing further common ground in European foreign and security policy. At the same time, it would provide a signal that the debate initiated by Germany’s Federal President, its Foreign Minister and Minister of Defense about a more active and responsible international role for Germany in international politics can also yield practical policy results. Dr. Thomas Paulsen is the Executive Director for International Affairs at Körber Foundation. Dr. Janka Oertel is Program Manager for Asia. By provoking nationalist sentiment, China’s neighbors are preventing its assimilation.